Today the material for A Star is Born is well-worn, given it’s been remade three times since 1937 – George Cukor did one in 1954, Frank Pierson did one in 1976, and Bradley Cooper took his turn in 2018. And just as it’s well-trod territory today, the story wasn’t exactly all that original in 1937. After all, just the year before A Star is Born was released, San Francisco contained many similar plot elements – the rando coming to town and becoming a star being the primary one. Worse way back in 1932 George Cukor directed What Price Hollywood? which had a plot that A Star is Born probably lifted wholesale. But, even then the plot wasn’t all that original to that film, since they all are essentially riffs on the Cinderella story. Which is a long way around of saying the movie is predictable as all hell. Obviously, we all know Vicki will succeed – this movie was never set up to be some sort kitchen sink drama about the harshness of failure. You also know that as she succeeds, Norman’s star will dim. You also know his ego will get the best of him and he’s not long for this world. The only thing that isn’t predictable is the ending. Yes, I expected Norman to be dead at the end of the film, because I knew that Vicki’s final line of, “I’m Mrs. Norman Maine!” was iconic. But I thought that would have been said after he died in some sort of alcohol-related accident, and she was more or less shaming people who snigger self-righteously about his death spiral. No, the surprise was his suicide was essentially a mercy-killing of himself, committed in moments of complete sobriety, and that Vicki’s declaration was more a sense of pride, and ownership, of the man she married and his memory, no matter how flawed he was. So, it’s predictable, but who cares? This isn’t really the sort of movie you see for a compelling plot – this is not some sort of puzzle-box mystery that has to fit together perfectly. No, we’re here because of the performances, which are all quite good. 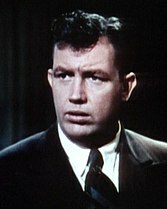 Of the supporting characters Andy Devine is well-used as Vicki’s first friend when she comes to Hollywood. I was most familiar of him as the basically-incompetent Sherriff in The Man Who Shot Liberty Valance, so it was nice to find him cleaned up, wearing a suit, and very much a go-getter, in his own happy-go-lucky way. Similarly, Lionel Stander is great as the pessimistic, fast-talking publicist who helps build Vicki and Norman up, but does not hesitate to poke Norman in the nose when he’s hit bottom. 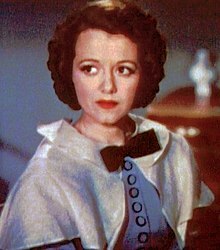 Janet Gaynor played Esther/Vicki and for the most part, she does well. She’s wide-eyed where she needs to be. She’s domestic when she needs to be. She’s supportive when she needs to be. And she lets the tears well up in her eyes as she tries to hold in her emotions when she needs to do that, too. It’s all very much the type of performance you might find in a women’s picture – a put-upon wife struggles to ‘fix’ her husband. What elevates her performance, though, are the two scenes where she’s trying on various approaches to lines of dialog and persona. In one, she’s a waitress at a party and as she serves hors d’oeuvres, she plays with different approaches to the guests and alternately affects Greta Garbo, Kathrine Hepburn, and Mae West. In the other, when she’s practicing her one line for her first role in a film, she goes around and around at it, playing it peppy, playing it bored, playing it brusque, playing it ditzy. While the rest of the movie proved she was certainly well-cast in the part, it was those two scenes that really showed Gaynor’s range and made you believe that, yes, Vicki/Esther had the goods to rocket to stardom. March is good as the alcoholic Norman Maine, but this role is much more than just playing drunk. No, he needs to be charming, yet unrepentant. He needs to be henpecked, but also a good-time Charlie. In short, he has to be the kind of guy capable of bad behavior, but charming, or talented enough, to make us not hate him and keep enabling. He also needs to not be outright pathetic in his portrayal, while still gaining the audiences sympathy. It’s a tough role to play, trying to thread all those needles, and March plays it well. Yes, the movie never really lets him get grimy or sweaty in the way these people would be in real life when in the midst of a bender, but the hint of it is there just the same. What’s kind of reveling about the movie is it plays like straight-up melodrama, even as it has much deeper themes. Yes, it’s about alcoholism and the perverse effect of celebrity on the celebrity. It’s about supporting and helping those you love, even at personal cost to yourself. But it’s also about how much luck is involved in truly going rags-to-riches. It’s about depression, jealousy, and above all else, it’s about the fragility of the male ego. In the end, that it’s not some silly melodrama, but has true depth, and themes to be explored, which is probably the real reason the movie endures. And probably why this particular story has been remade those three times. I often complain about weird stylistic quirks in movies that show up for one scene, or two, for no good reason. In particular I hate voiceover at the beginning of a movie to set the scene for us, never to be heard from again. See for example The Departed. Mercifully, A Star is Born has no voiceover, though it does begin with a shot of the script for the film laying on a table, then being stamped “Final Shooting Script,” then being opened so we can read the first few lines of the script. From there we’re given a title card telling us the film was a complete work of fiction. Then the film finally starts properly, with it’s exposition-heavy opening scenes. Watching that opening I was afraid we’d get shot after shot of the script, as if we needed this sort of an affect to carry us through, but mercifully it did not return until the very end, where we see the final lines of the script onscreen, fading out into the credits. On the one hand, I like a film that does something different, that has some style. On the other hand, I don’t like a style that makes no sense. In particular, I struggle with both Sunset Blvd., and American Beauty, because they’re narrated from beyond-the-grave. I mean – who are they telling the story to? Anyway, in this instance, there is no good reason to have the script on screen at all, other than to remind us we’re watching a movie, as if we couldn’t forget. There was no competitive Oscar awarded specifically for color cinematography in 1937 – there was only the one category that contained them all. Later there would be two categories, one for color, one for black and white, given out from 1939-1967. But in 1937 there was just the one, with The Good Earth winning over Dead End and Wings Over Honolulu. Greene was given the two Special Oscars for color cinematography, and would add a competitive award for his work on The Phantom of the Opera (1943), which he shared with Hal Mohr. He would add a total of six other nominations for color cinematography, even competing against himself in 1942 for Arabian Nights and Jungle Book. The thing is, despite receiving the Special Oscar the cinematography on A Star is Born is not all that special. It’s not all that expressive, it really doesn’t reveal anything about the story. It neither adds, nor detracts – it’s just there. That all said, there is one truly great show in the movie, at the end when Norman has decided he will commit suicide. While Vicki goes to make some food he says he’s going to go for a swim in the ocean – they own a beach house, so the ocean is right outside the front door. Well, the last we see of Norman is a distant shot as he walks into the surf, then swimming towards the rising sun. It was such a perfect way for Norman to exit the movie – literally swimming into the rising sun. Which, if you think about it, is impossible in California. After all, Norman was just picked up from having plead guilty in night court and taken to the beach house. He lays down a while and when he gets up it appears that morning is coming on. That’s when he goes out to swim into the rising sun. But as the beach house is on the Pacific Ocean and as the sun still sets in the west and rises in the east, there’s no way that can happen. The only other Oscar given to A Star is Born was for Best Writing (Original Story) to director William Wellman, which he shared with Robert Carson. Obviously, the funny thing here is that the story for A Star is Born was hardly ‘original. But, you may wonder, how is it that A Star is Born had four credited writers – Carson and Wellman credited for the story, Carson, Campbell and Parker for the screenplay – but only two won the Award? It’s because in 1937 there were two writing Oscars, for the Original Story, the other for the screenplay, which are categories roughly analogous to todays Original Screenplay, and Adapted Screenplay. Only then it was possible to win both: A Star is Born was in fact nominated in both categories, meaning that a film could win for it’s original screen story, and also for the screenplay adapted from it. Interestingly, two films wound up in both categories – A Star is Born and The Life of Emile Zola – with each winning one. Nevertheless, this was the first, and only Oscar for director William Wellman out of four total nominations. Fun fact, Wellman directed the first Best Picture Winner, Wings – or one of the two first Best Pictures, since there were two separate Best Picture Awards at the first Oscars – but did not receive a corresponding nomination for Best Director for the film. Interestingly, the winner of the first Best Actress Award? The star of A Star Is Born, Janet Gaynor. Not that playing convincingly drunk is some easy thing – it’s not. Just watch Kenneth Branagh flail around as a drunk at the end of Peter’s Friends for an example of an unconvincing drunk performance.